Once upon a time, I made this most delicious fig, apple and pomegranate jam. Eighteen months on and I still have a couple of jars of it left. Or I did have; I’ve just used one of them up in these flapjacks. Instead of making flapjacks with sugar and golden syrup, I thought I’d try making some with jam. This seemed a good flavour to use as it’s quite tart and I didn’t want my flapjacks to be sickly sweet, especially as I was going to use a whole jar. This has to be the quickest bake I’ve ever made, it was so simple. Luckily, they turned out to be rather good and I’m feeling pleased with myself for discovering another way of using jam. I also had some chocolate sauce leftover from my Easter bundt cake, which in itself was leftover from the Easter egg ice-cream. This really is the last of it – honest! I warmed it up and drizzled it over the flapjack in an attempt to make them slightly more sophisticated. Some of them went to the workmen who were putting up a fence in next door’s garden. I’m very excited about this as it has given us our privacy back after they chopped down the hedge a couple of years ago. I was also rather excited to find I’d won a £20 voucher from Your Liskeard to spend in local shops by sending in a photo of the oats I’d bought to make these flapjacks. There is a weekly prize for one of the photos sent in showing what has been bought from a local shop, which I think is a fabulous way of promoting Liskeard retailers. A quick and simple recipe to get something sweet and delicious onto the tea time table in record time. Melt the butter and jam in a large pan over a gentle heat. Add the oats and stir until all combined. Press into a greased 8″ (20 cm) sq tin or cake mould and bake at 180℃ for 25 to 30 minutes when the top should be golden brown. Drizzle with some melted chocolate or chocolate sauce if desired (I melted down some leftover chocolate sauce). Leave until cool, then cut into 12 pieces. I’m sending this off to the ever groaning Tea Time Treats table where I would just love to be. This month’s theme of Jams, Curds and Preserves was chosen by Karen of Lavender and Lovage and the challenge is alternately hosted by Jane of The Hedge Combers. And such a frugal recipe as this just has to be added to Credit Crunch Munch which is hosted over at Fab Food 4 All and Fuss Free Flavours. As the oats were bought from our local health food shop and won a prize for me into the bargain, I am entering these oath flapjacks into Shop Local over at Elizabeth’s Kitchen. And as these saucy jammy flapjacks are definitely my idea of fun, I’m also sending these off to Laura at I’d Much Rather Bake Than … for her monthly Biscuit Barrel challenge. Thanks Laura. What I loved about this as well as using up some jam was the simplicity of the ingredients and the speed of preparation. This is a great idea! I always have a lot of jam around too – I might try this with some of my marmalade stash! Oh yes, marmalade flapjacks would be perfect. Like the jam I used, the result wouldn’t be too sweet and would have such a lovely flavour. I’m thinking marmalade and melted chocolate. Plum and raspberry jam sounds so good and I bet it’s a wonderful colour too. Sounds like some of it really should make it’s way into a flapjack – especially paired with white chocolate. Just 3 ingredients!! This is definitely a keeper, Choclette. 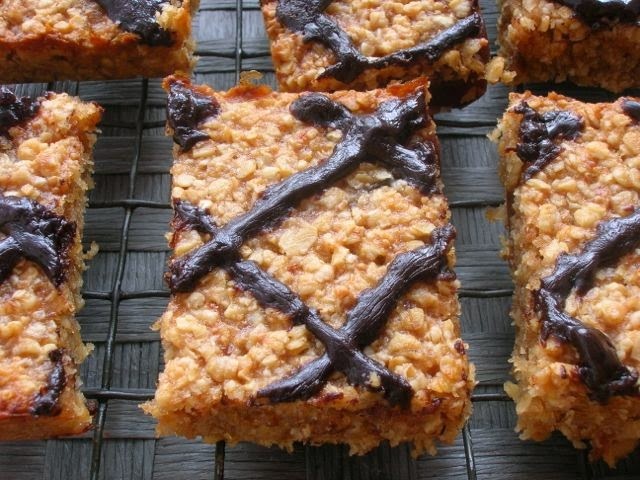 Flapjacks are one of my real weaknesses (probably why I don’t make them – I’d eat them all!). These look incredible! Now that might explain why I haven’t seen any flapjack recipes on your blog CC. A FAB Tea Time Treats entry and I am a HUGE flapjack lover, and these look amazing! Thanks Karen. I may never have made these if wasn’t for your TTT. Wow – these are so simple. They sound delicious too. Thanks Dannii – love simplicity. And these are slightly healthier than your normal flapjack too. This looks so delicious! I really want to try this recipe! Thanks LL, do let me know what you think if you do get around to making them. These look yummy and perfect for that morning snack, inviting you to send them to Lets cook sweet treats for Easter event at simply.food. Thanks Nayna – I have submitted something a little more Eastery to your event. I too have jars of forgotten jam and now I have a reason to search the shelves. I want to make this recipe next weekend. Lovely to meet you yesterday by the way! I know what you mean about left over jam. I try not to make too much and get a few jars of my Mum’s best raspberry jam for those occasional scones or hot cross buns. Your flapjacks look fantastic, I love the criss cross of chocolate sauce. Thanks Janice 😀 It’s funny, despite my sweet tooth, I don’t really eat a lot of jam. I was looking at that recipe for the chocolate in the ingredients…just added at the end? optional? are you slipping? So simple and so delicious. I don’t think I’ve eaten a flapjack for several years – there must be something wrong with me. Ah, but Phil you have all those lovely French recipes to keep you going. If you melt the jam on a very low heat with the butter, you should be fine. But you’re right, it probably does burn quicker than syrup. It is creative that you are using Jam (especially such lush sounding jam)- I would never have thought off it. Thanks Bintu, being creative with my baking is what makes it all so much fun – when it works! Thanks Brogan, I agree. These weren’t in the least bit dry, but as you say soft and chewy and so variable spending on the jam used. Love the idea of using jam,I’ve still got freezer jam left from last year. I added peanut butter to some flapjacks recently which (if you like peanuts) were very moorish. Peanut butter flapjacks sound wonderful. I’ve used tahini before, but not yet tried peanut butter – yum. How interesting! Here in America another name for pancakes is flapjacks. So, I had no idea what these were and had to google “flapjacks in the UK” LOL Then it made sense. They look delicious! I love new ways to use jam. I frequently put it in breakfast casseroles. Ah, that’s interesting Stephanie. I knew flapjacks were something else in the states, but hand’t realised they were pancakes. Now I’m wondering what a breakfast casserole is. Thanks Camilla. Now I’ve discovered this trick, I’m looking forward to trying them with other flavoured jams. Wow what an amazing recipe!! I love the idea of using jam instead of syrup! They look delicious. I’ve only made the standard golden syrup variety of flapjack so now I have to try them with jam! This is genius! I always have half-finished jars of jam lurking around the place, now I know what to do with them! Lucy perhaps I’m setting a new trend for jammy flapjacks. Now wouldn’t that be great? What a clever way to make flapjacks – I must try this soon – off to pin to my must do’s board – thanks! My husband would love these as he’s a runner and is alway wanting more oaty flapjacks made for him. I’m sure there’s a jar of plum jam in the back of the cupboard as well! Thanks for linking again to this month’s No Waste Food Challenge. Thanks Ness – funny how there’s always a jar of jam or two at the back of the cupboard. When I read this recipe I decided to have a go and put the oven on straight away. I used 285 grams of rosehip-confiture (beginning of mould and needed finishing asap) and 115 grams of plum-jelly (jar from 2008 and still tasty). What a great recipe this is ! Even without the chocolate it is really good. Pleasant taste and texture and another great way to finish some jam. Quick and easy to make. Many thanks ! Ooh yes, rose and plum sound like a lovely combination Henk. Quick and easy make flapjacks a firm favourite. Glad you liked them and thanks for letting me know. I have jam going back a few years too, but my mother wins the prize with 15 year old jars of jam that are still usable. Second try today. I wanted to finish a few jars of old jam again. I added 40 g of honey and 40 grams of seeds: linseed and black sesame. After baking I melted 100 g of dark chocolate + 25 g milk and covered the flapjacks with it. Just had a piece with my tea: nice ! Wow, you really went to town Henk. I like the idea of the seeds and chocolate obviously. I made some of the chocolate coconut ones today, only I added rum and used coconut oil instead of butter.